Sew, craft, cook, and more! 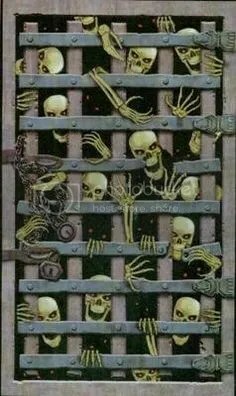 Well I decided that even tho I didn’t share my Halloween throughout October, I’d share what I did to save money this season, still have a great party, great decor, and amazing costumes on a dime! 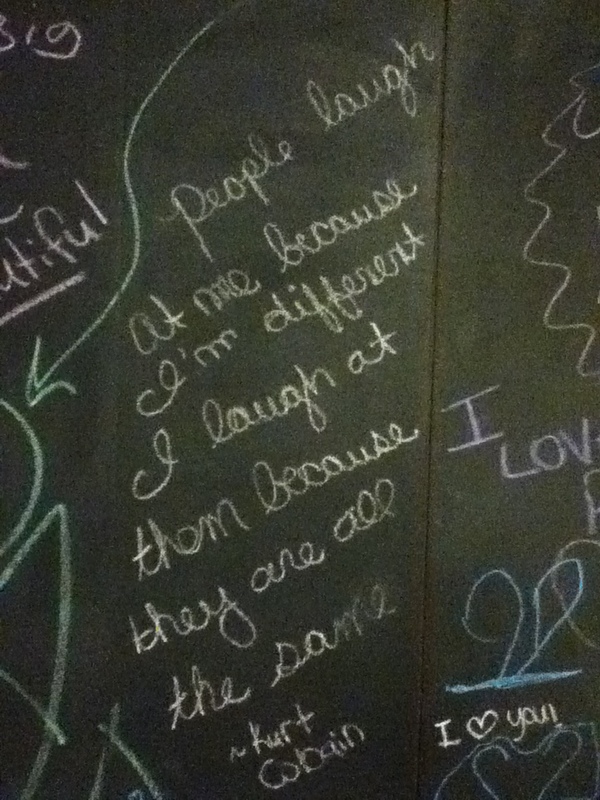 This one we taped onto the brick right outside our front door. *TIP* Dollar store boxing tape stuck and stayed on the brick! 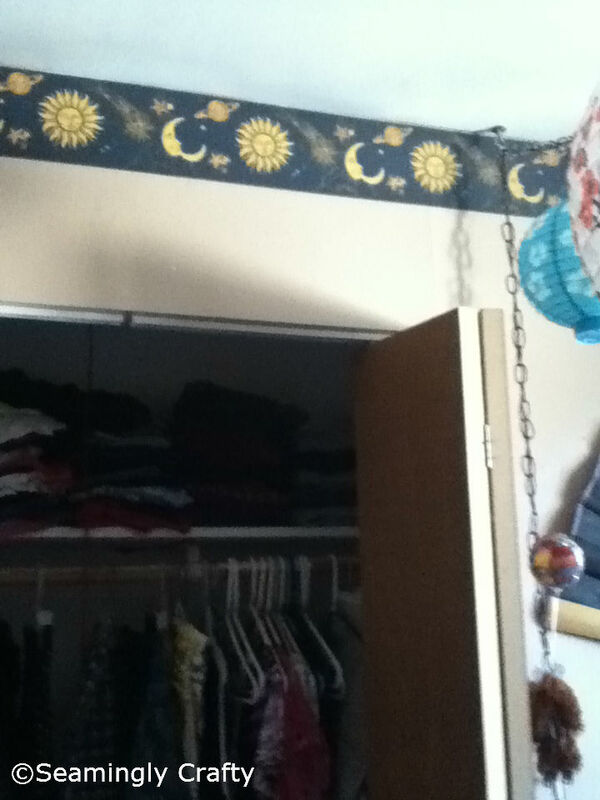 Be sure to tape all around to keep the wind from getting under it and ripping it off the wall. We hung up several different jointed life sized cutouts as well. 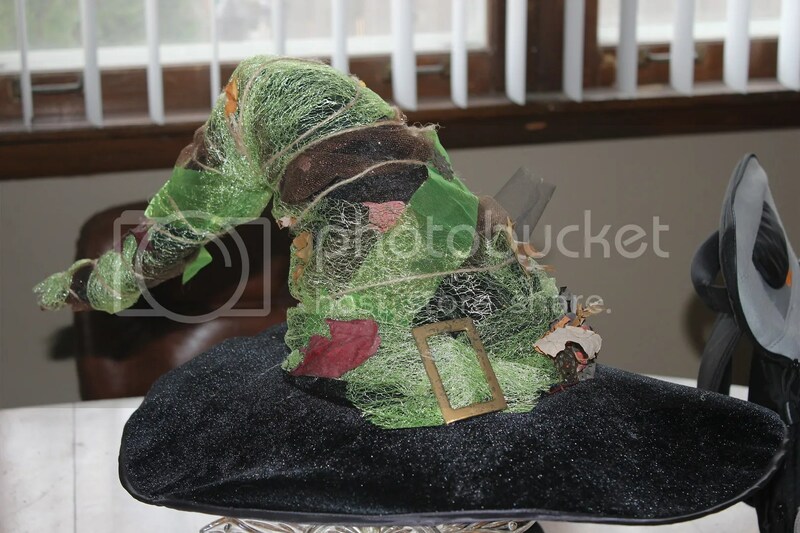 DON’T THROW AWAY THAT BROKEN BATTERED HALLOWEEN DECORATION!! 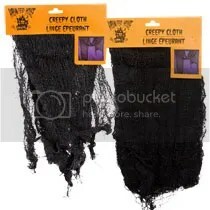 Creepy cloth can be purchased at the dollar store. A must! It comes in black and gray. Fred E. Krueger his headstone is dressed up with a hand painted Elm St. Street sign and of course his razor knives glove laying on the grass in front of the headstone I made it with an old winter glove spray painted brown and cut out of foam board the knives. Micheal Myers his headstone is dressed up with his iconic butchers knife purchased from the dollar store it came white glow in the dark I painted it with silver and blood red. Jason Voorhees his headstone has his iconic hockey mask screwed to the top corner and his iconic machete screwed to the other side. Jedidiah Sawyer I haven’t come up with a way to incorporate his iconic chainsaw but I did lay some severed body parts from the dollar store by his headstone. I’d love to hear chainsaw ideas!! I made a small coffin a couple years ago to cover our fog machine. 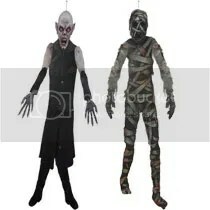 I also had purchased after Halloween a couple years ago 3 small headstones with tubes that attach to the fog machine. even tho they were made for the machine I have, the machine melted the attachments. I have yet to come up with a way to fix it but still put the headstones out. Here’s a link to my Instructable on making the coffin. NOTE* Please follow your instructions that came with your fog machine. My dimensions were cut to fit a small fog machine and I was sure to keep the end protruding out to keep the fog end cool. 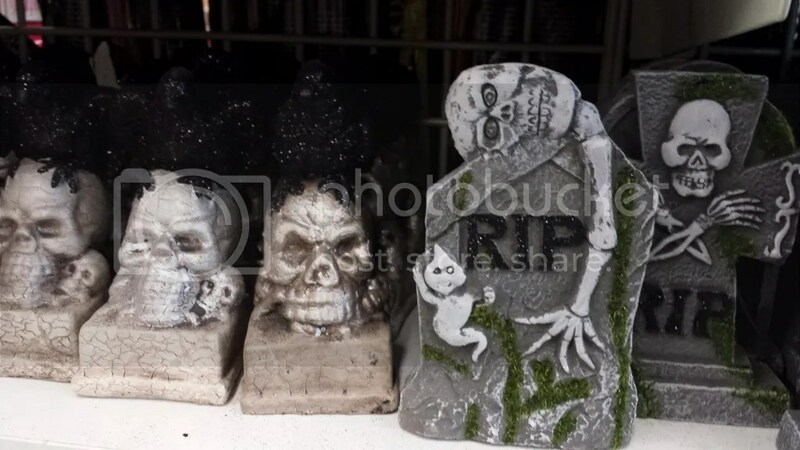 My daughter and I love these little headstones at the dollar store. We grab one or two every year. They make a nice mini cemetery for the mantel or coffee table etc. We added some mini plastic skulls and mini skeletons from the dollar store. While browsing Pinterest I came across this amazing life size spooky tree at 102 wicked things to do blog. I knew I didn’t have time to make it for this Halloween but as my daughter and I were cleaning up after making a Halloween wreath I thought Hmmm…. 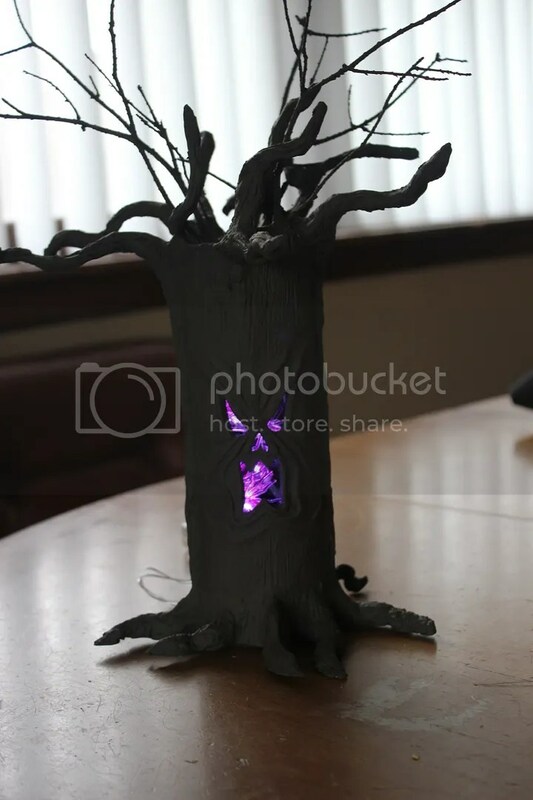 how about a mini spooky tree for our mini cemetery! YES! So I kept the cardboard rolls from the dollar store ribbon we used on the wreath and followed most of the her instructions and created my mini spooky tree! I LOVE IT!! I added some purple spider LED lights also from the dollar store. 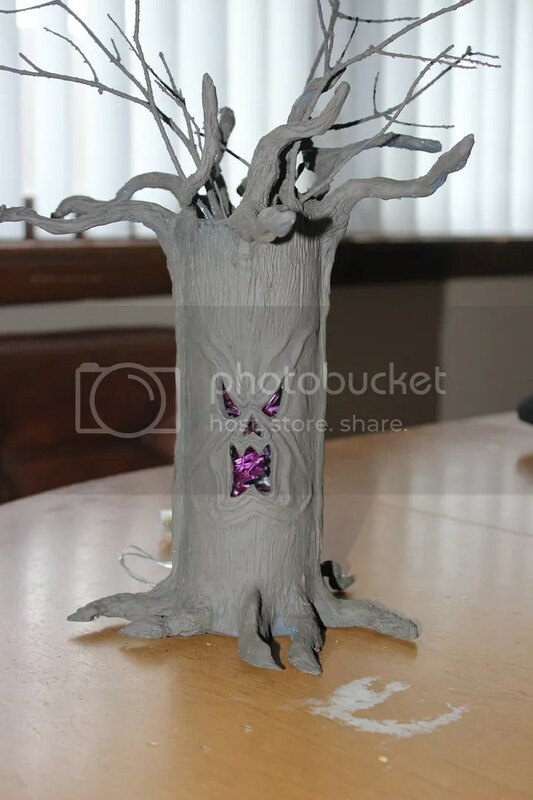 Also on 102 wicked things to do blog I found a tutorial on how to make candles that look real but use cardboard tube and LED tealight candles from the dollar store. We made 5 of them 3 for our candelabra and one for the bathroom candle holder. She hit it on the head when saying you don’t want anyone catching on fire at your Halloween Party. I actually had someone almost catch their hair on fire on my toilet… yes… toilet…. I had a tealight burning on the back of it thinking it would be safe. yes I thought it would be cause I don’t sit back and relax on the pot lol so these candles were an awesome SAFE way to spook up the commode. Find the tutorial HERE. For the Halloween Party Costume contest I used her idea for the trophies! They turned out great! I made the background a goldish color on the labels. Printed them out on plain paper, cut them out and used mod podge to attache them to the bases of the trophies. My daughter and I had so much fun making these! And even more fun awarding them to the winners! For voting I used 3×5 cards cut slits down one side to make 9 tabs, I decorated paper lunch bags and taped them to the wall around the voting table. Taped up simple rules for voting (ie. only vote once for each category) and left the cards and several pens on the table. I bought a few different flavors of 3 liter pop and made fruit punch and iced tea. All our supplies were purchased at the dollar store. That was some of our 2014 Halloween! To wrap up this post I’ll leave you with a few pointers and must haves list for the dollar store. The dollar store stock sells out FAST! I missed out on a couple of things I really wanted cause I waited to buy them. 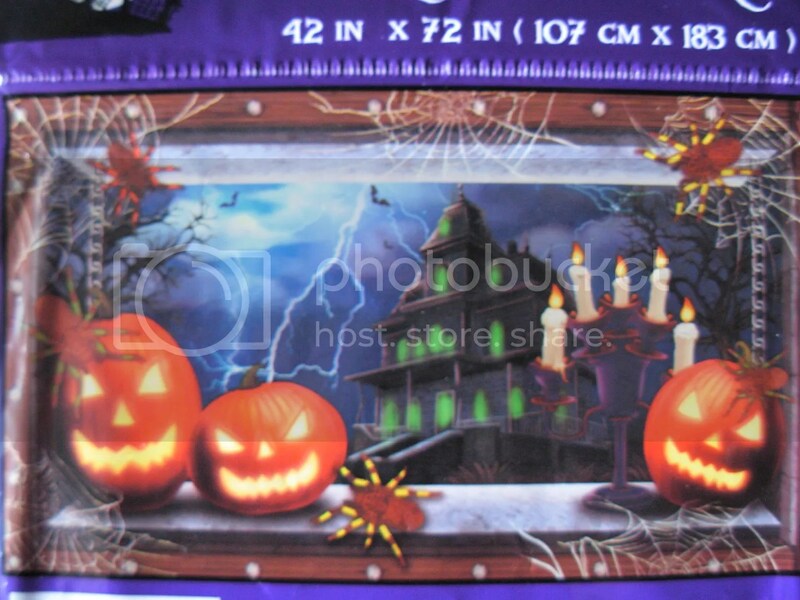 Start shopping for Halloween at the dollar store at the end of August. 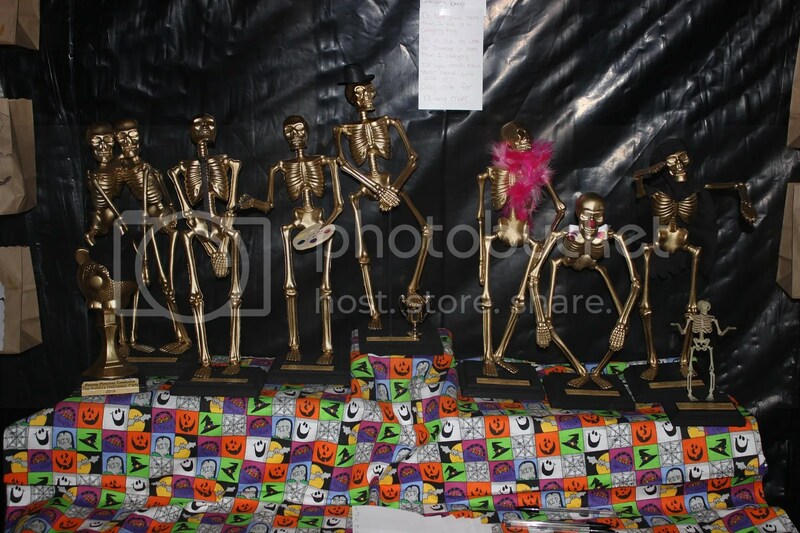 The items that don’t sell out too fast are skeletons crows and spiders these they seem to re stock or over stock. SHOP FOR HALLOWEEN CANDY AT 5 BELOW if you have one near you. I try to avoid the dollar store for this because although you think you are getting a deal in some cases you aren’t. By the time you purchase enough bags of for example charms suckers to equal the amount you get in a grocery store bought bag you are paying the same price if not more. Certain candies are ok to purchase at the dollar store like dum dums and pixi stix. You can always price and weight compare before you buy. SHOP NOW! Halloween clearance is up to 75% off right now! You can get ribbon, decorations, etc. at a fraction of the cost! Even the dollar store clearances their Halloween stock. Think simple for party food! Stick to one theme. example tacos. This will keep your cost low. You can also make it a pot luck ask your guests to bring a spooky dish. And always do BYOB (bring your own booze) We do offer what we have to all our guests but I always throw BYOB on the invites so the guests know they are welcome to what we have but any special drinks they should bring. Think simple for your decor if you host your party out in the garage or a tent. We put up black poly plastic on the walls and over our not so sightly garage junk hung up some caution tape all around. DONE! Our guests were welcome inside or out. If you have your party outside or plan on having any outdoor activities ALWAYS have a back up plan. We had intended to have spooky stories and pass the story game by the fire pit. Hot apple cider by the fire pit, and Halloween movies on the back of our house using a friends projector for fire and a movie after games and stories for the kids. However, the wind was horrible so we couldn’t put up the party tent and couldn’t safely have a fire and since it was so cold and windy we couldn’t do the movies either. So instead we hung apples on strings for no hands apple grabbing game. I printed out free coloring pages from crayola.com and my daughter offered several board games for indoor activities. I would have done more but I didn’t have a back up plan. 😛 the weather changes like crazy here! That about wraps it up for this Halloween Post! Until next time… Keep it Frugal! Hello!! My it has been quite some time since I have posted. I apologize for my neglect and being totally MIA for so long. I have been going through many life changes and self discovery. That has all come with so many ups and downs. Anyway, enough of that stuff. Lets move on to what I’ve been up to in my many months MIA. 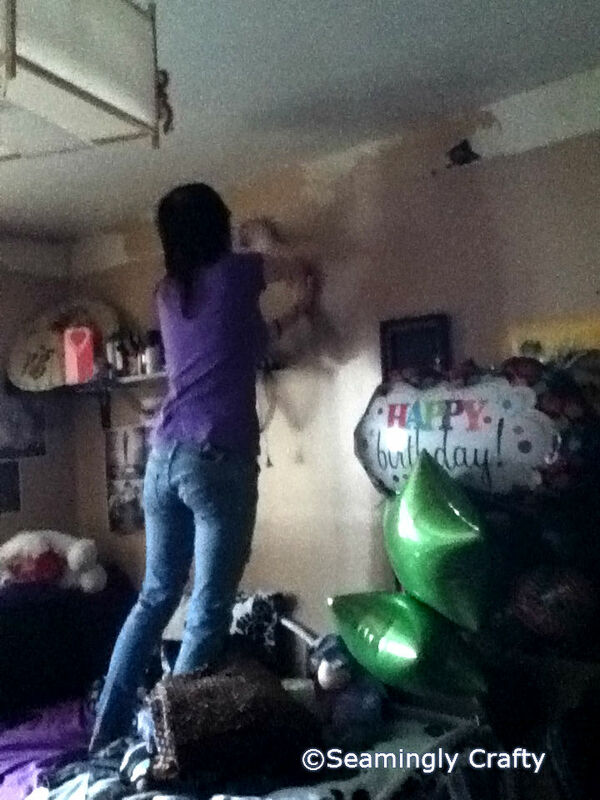 We’ve been doing lots of remodeling (on the cheap), finding ways to give the place a face lift that wont break the bank. We started in our kids rooms. 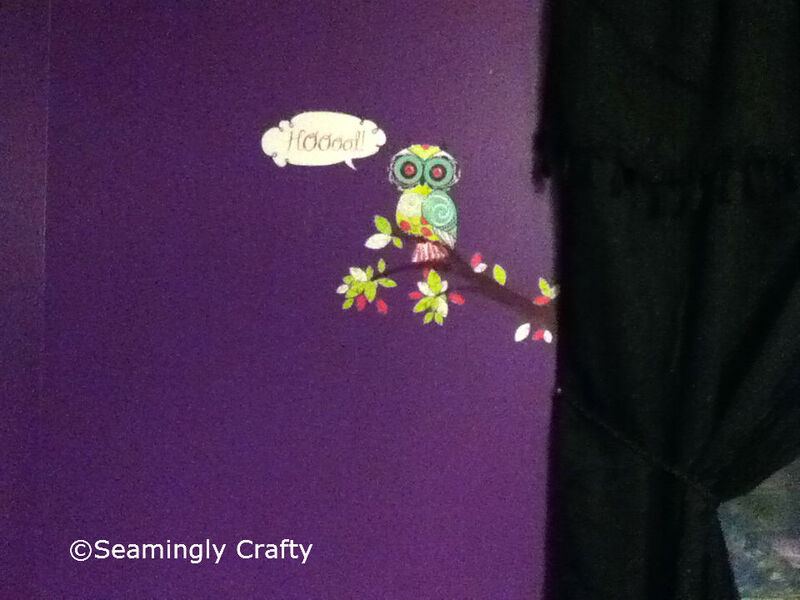 In this Volume I’m going to share with you what we did to customize our daughters room. She did most of the designing with much advise from me 😉 but most of it she made the choices. 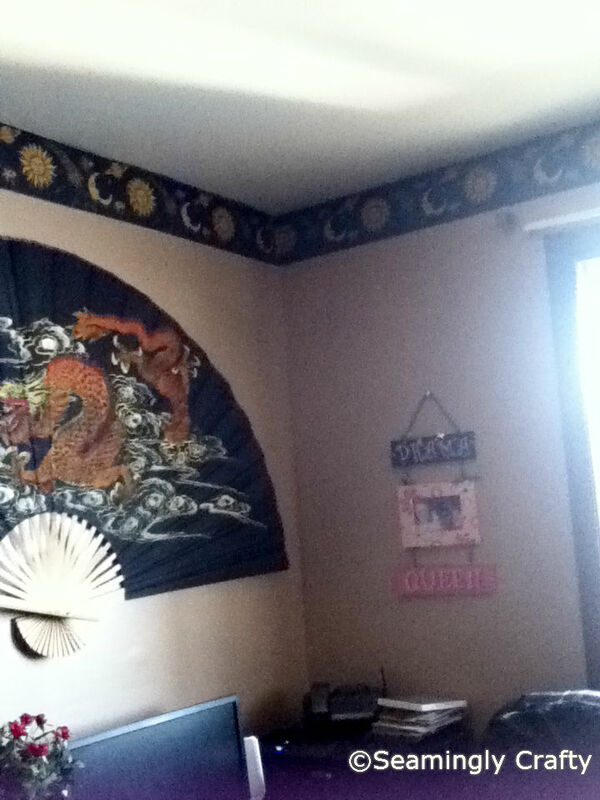 The room was painted a creamy coffee color. That just wouldn’t do. 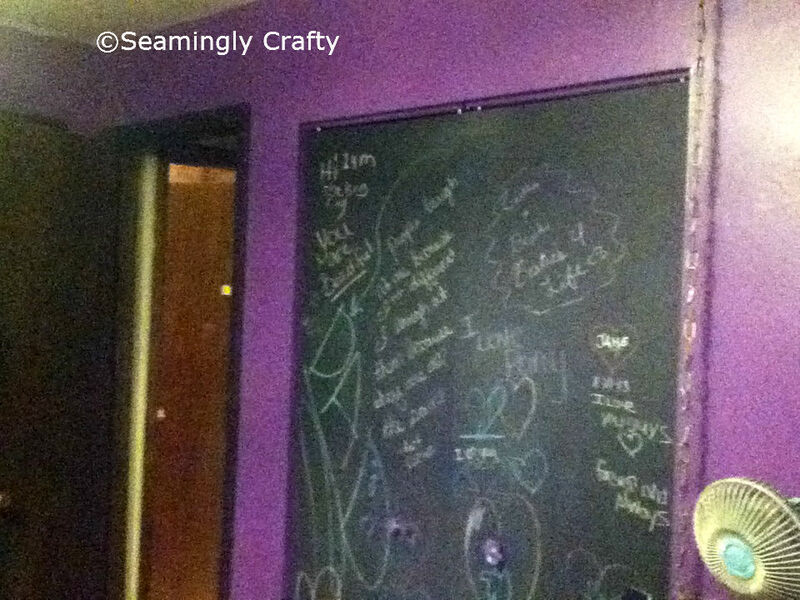 So I began scouring the interwebs for bedroom designs in purple and black (her colors) to get some inspiration. We found a few we liked and grabbed ideas from several images. Above: In a future post I will share how I made this custom chandelier. 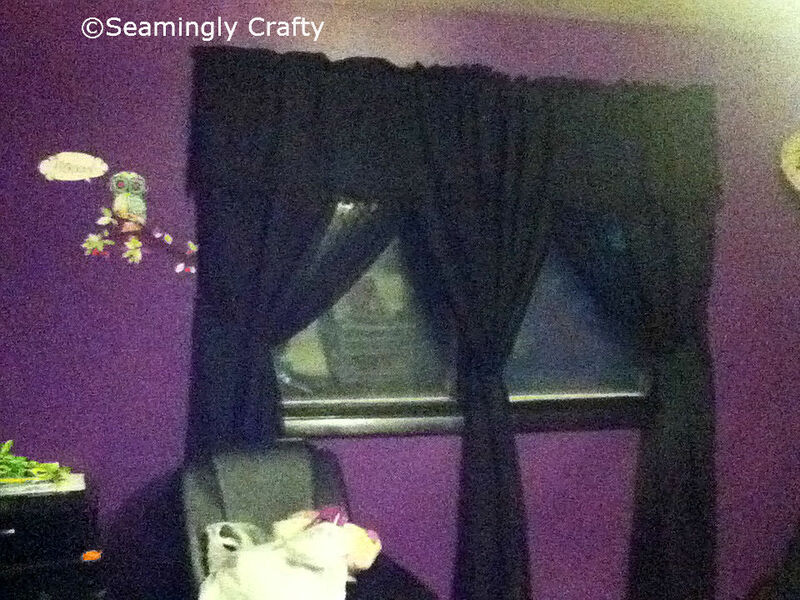 These curtains we found at our local family dollar for $12 each panel. 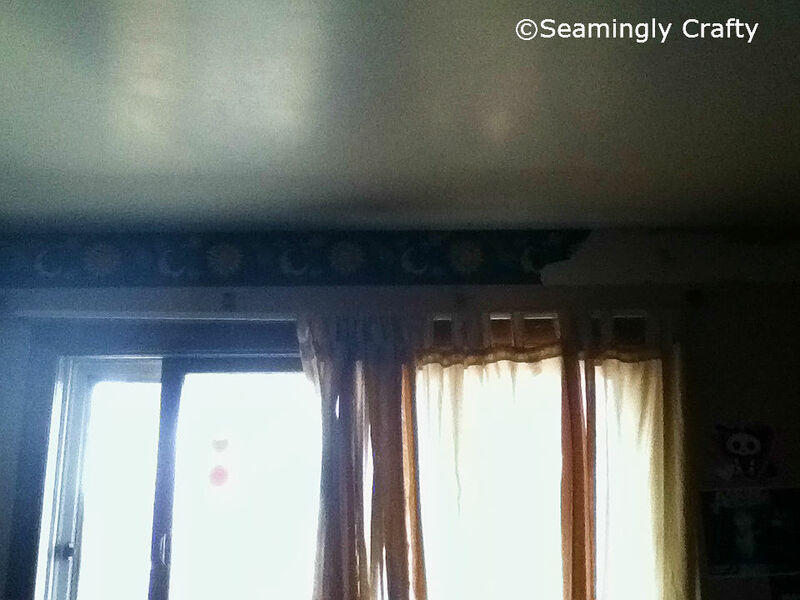 The are single rod silk swirl design drape and valance with lace drape in the back. 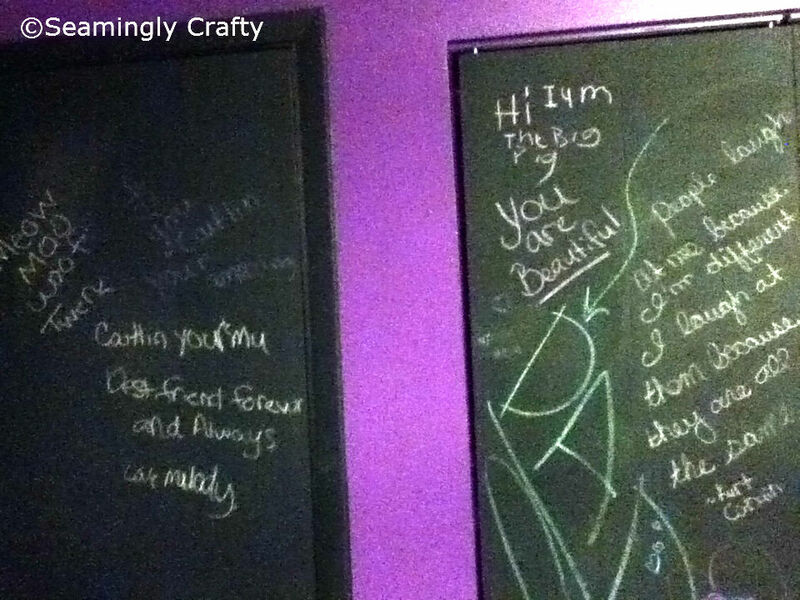 She decided to paint the closet and entry door with chalk board paint so her and her friends could write little notes. For the handles we purchased a key and keyhole knobs from Hobby Lobby on sale 50% off. We painted them purple. 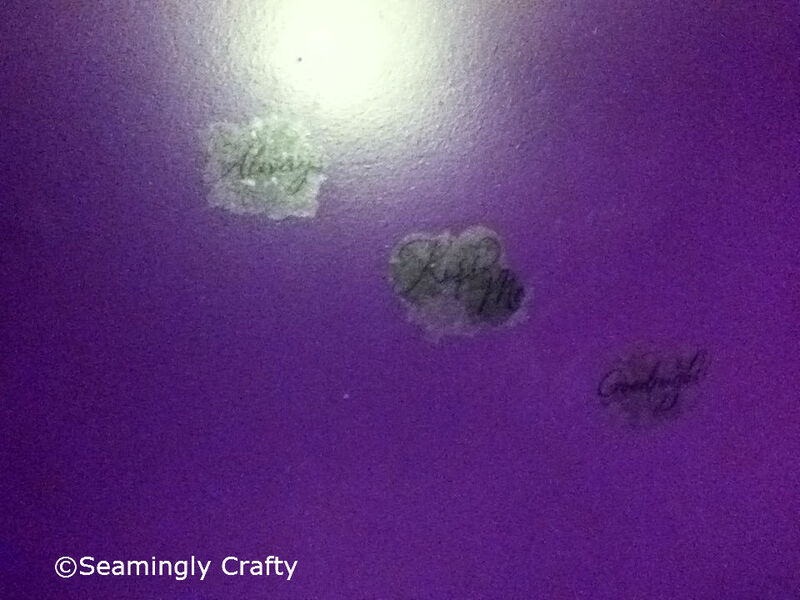 This is her focal wall it is sprayed with purple and silver glitter over the purple paint. 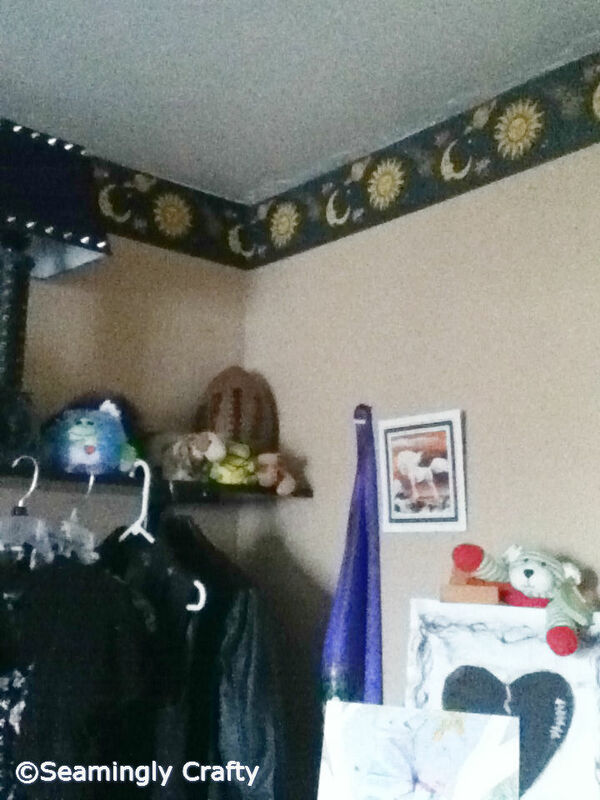 Really hard to see it in the photo, but it’s there. 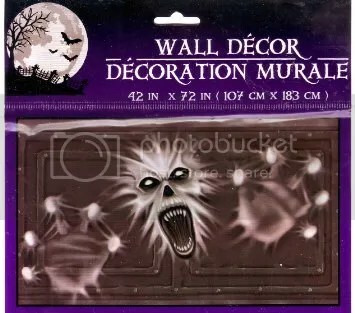 🙂 That was a bit pricey but I later found out it would have been cheaper if I had purchased the paint from walmart instead of Hobby Lobby :S Lesson learned. 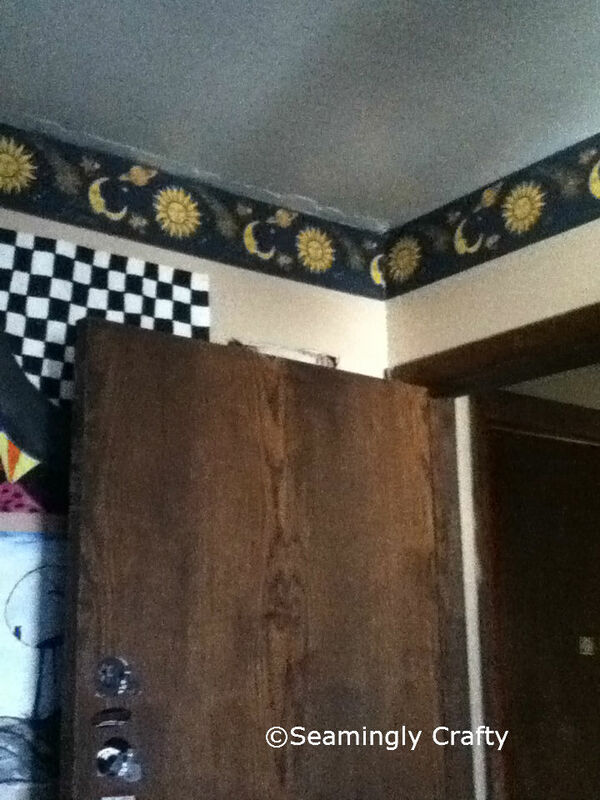 The trim in the room was painted with a semi gloss black. 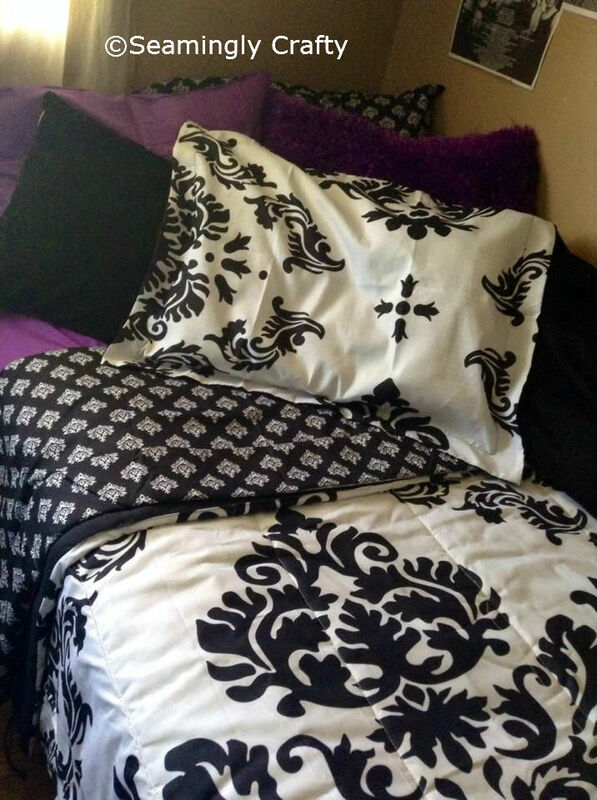 The bed set with the purple sheets. Till then Keep it Crafty! I have found a little time to work on a few projects. One of them is these signs. Another thanks to Pinterest! My husband brought home a few big boxes of these pieces of wood. They look to be sides of drawers. I instantly had ideas floating through my mind. I am a big fan of these cute signs you see all over the net. I think they look amazing with decor. I tried giving them a distressed look. 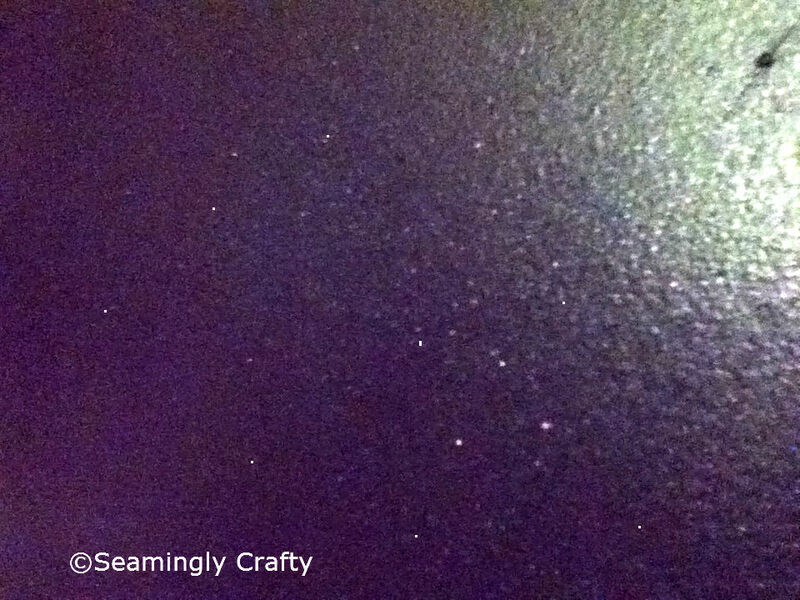 The sign above I used a potato stamp for the small stars. Cut the potato in half. Using the stencil and the pencil 😉 trace or just draw out the shape you want to stamp onto the cut end of your potato. You may need to scar the potato if it is really wet the pencil may not show up. using your paring knife carefully start cutting away the potato around your shape. once finished dab the the potato on paper towels to dry. Dip into paint and stamp away! The above sign is my favorite! It represents these tough times in my life that at times seem unbearable but through the grace of God, my will to push on and great friends and family (anchors) I have remained sane. My experiences as a wife and mother, homeschooling, and caring for a family. Health, nutrition, and natural living.